I am so very excited to share the news. My book video trailer has been accepted for a video contest. The incredible animation that Misty, from Trailer to the Stars deserves to be recognized! 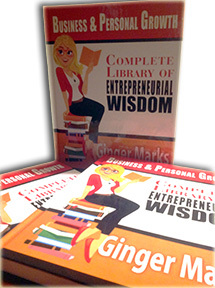 The September Voting Poll is up and the Complete Library of Entrepreneurial Wisdom book trailer is in the running. Make sure you go over and vote for my video trailer (#11)! Voting will close on September 27! Please direct your friends and followers to http://yougottaread.com/category/video-contest/ to vote for your video. This book will soon be available to the General Public as its launch date is September 26, 2013! I just had to share. I needed to make a button ad for Home Business Magazine. Now that seems like an easy thing for a designer to do you would think? But no, then I go and get an idea of having the girl holding MY book in her hand. Oh, why do I get these ideas? LOL. So here we are hours later, with what I hope is a workable solution. What do you think? Have you ever been so excited that you let loose too early? Well, that is just what I did in my last post. While Misty Taggart of Trailer to the Stars was putting the finishing touches on my Complete Library of Entrepreneurial Wisdom animated book trailer I posted the link to it. Well, now it has been revised and I don’t remember where all I posted it! Egads! Backtracking and back peddling to try to remember where all I posted the old link so I can update it. Nigh impossible! You think somebody would notify me if they see a broken link on their website, but no word. It’s not like the contact information isn’t in the trailer, eh? What do you do in this circumstance? Well anyway, here’s the new link and I’ve updated the link in the previous post as well. Enjoy the final version with me. I am so excited I can hardly contain myself! Look at the unbelievably perfect book trailer Misty Taggart of Trailer to the Stars has created for my book Complete Library of Entrepreneurial Wisdom! Click the image below to see why I am so excited and view the book trailer on YouTube! Yesterday I went out to lunch to celebrate my anniversary with some friends. When I got back there were three boxes on my door step. Guess what was in them? Yup! The print books are here. Only problem is, one of the blank pages in the beginning is missing. Agh! This makes all the left side pages even numbered and right side one odd. How odd! Nevertheless, the content is all there and the index and table of contents are correct. So, I spent the late afternoon resending the file to the printer with, instead of a forced page odd break, an inserted page. I can’t figure out why Adobe PDF Pro can’t render a proper odd page break when switching out of Roman numerals! Needless to say, I have a few books that will go cheap. If you want a signed copy let me know and I’ll send you one of these for only $17.00 plus shipping. Regular print edition is $29.95! Anyway, the book is beautiful and HUGE! It really IS a tome! Amazon is working on getting the cover up, but the Complete Library of Entrepreneurial Wisdom is finally available in print! I just ordered a few copies too, so if you want a signed copy, leave a comment and I’ll be sure you get one.